It’s being billed as a sensitive look at the causes of dementia, misinformation surrounding the disease, and the individual and personal experiences of people touched by it. “This is Dementia” will premier Thursday on Netflix examining the experiences of one man as a dementia educator, academic researcher and grandson of a dementia sufferer. Audiences will be able to hear from someone who has both witnessed dementia in his family and has the medical expertise to offer straight facts on the disease. That man is Neuropsychologist Dr. John DenBoer—a U.S.-based dementia researcher and the creator of Smart Brain Aging—a company that helps delay the onset of dementia and reduce its severity through a science-backed brain-training program. DenBoer works in the area of early-stage dementia detection, specializing in developing intervention mechanisms to help prevent the further development of the dementia process. He was studying geriatric neuropsychiatry in 2004 at the University of Montana (UM) and about to head to the VA Boston Healthcare System to complete his internship, when his grandmother began to develop dementia. “That’s when I started getting interested in how to identify dementia early and how to prevent it from getting worse.” He has since named his nonprofit—the Jean Seeling Dementia Prevention Foundation—for her. In his documentary, DeBoer points out the widely-held belief that Robin Williams was suffering from undiagnosed dementia before his untimely death. Also included in the film is footage of other celebrities—such as Samuel L Jackson, Seth Rogen and Hector Eliondo—sharing their personal experiences of the disease. As we get older, cells die and the body ages. But dementia is something else entirely. An accelerated aging of the brain compared to the rest of the body, dementia ages the brain faster than usual causing shrinking of certain brain regions, especially in the mid-brain where memories are stored. There are different types of dementia based on causation. Alzheimer’s, for example, is believed to be caused by an abnormal build-up of proteins in the brain, DeBoer said. Someone develops Alzheimer’s every 65 seconds. The number of cases is expected to triple in the next 10-15 years. Dementia is the 6th leading cause of death in the US, claiming more lives than prostate and breast cancers combined. 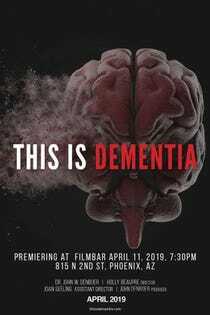 “This is Dementia” will also premier at FilmBar at 815 N 2nd St., in Phoenix, Arizona and on Amazon, Hulu, iTunes and Google Play on Thursday, August 11. For more information on DenBoer’s SMART Memory Program® with SMART Brain Aging, click here.